What's Your Swim Type? : The Arnie ~ Feel For The Water! Advice & Tips to Improve Your Swimming. Over the coming weeks on the blog we're going to profile each of Swim Smooth's Swim Types. Spot the profile that best fits your individual swimming, use it to understand what's holding you back in the water and then use Swim Smooth's refined stroke correction process to take some big strides forwards in the water! The Arnie (and the female version The Arnette! ), is the classic swimmer who fights the water when they swim. 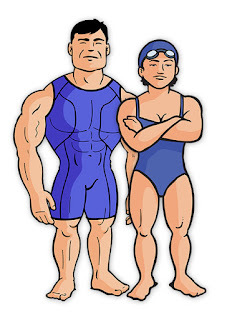 They are athletic people, normally with a background in land based sport but are relatively new to swimming. As triathletes they make for strong cyclists and runners but their swimming significantly holds them back. Arnies find swimming hugely frustrating but due to their athletic prowess can make large jumps forwards in speed more than any other Swim Type if they work on the right things in their stroke. Getting their body position higher should be their primary focus and one of the first ways to do this is to improve kicking technique. As we see above, most Arnies kick by bending a lot from the knee wasting energy and pulling the legs low at the rear. Pressing down like this is hard work and lifts you up at the front but sinks the legs. Some catch technique work to help you learn to press the water backwards at the front of the stroke is going to really help you here. This crossover also results in a scissor kick at the rear, creating even more drag and pulling the legs further downwards. Straighten things out at the front with some key drills and the twisting and scissor kick will in-turn disappear. Most Arnies have good rhythm to their strokes but in the short term would be well served by slowing their stroke down slightly using a Tempo Trainer Pro. This should only be slightly slower - we're not looking to kill all sense of rhythm, just give you a little longer to maintain control and straighten things out. The danger here is slowing things down too much by adding a pause-and-glide at the front of the stroke creating the classic Arnie-Overglider cross-breed. Using the Tempo Trainer to drop stroke rate by just 3 to 5 SPM will maintain a flowing stroke and have most Arnies swimming slightly quicker and significantly easier, even before any other technique work. Often drives a large 4x4 vehicle. May not have their own email address but use their partner's instead (just something we've noticed over the years!). Arnies are classic 'overachievers' pushed forwards by their ambition and go-getting nature. However some of this urge to succeed needs to be controlled when it comes to swimming with the right drills and visualisations to improve your stroke technique. 1. Wouldn't it be more sensible to recommend to the Arnie the shorter distances? Sure, they have to work on their technique, as discussed, but aren't they better suited for the shorter distances? 2. You mention one mix, Arnie+Overglider, but in my experience, the Arnie+Bambino is more common (so well, should also be considered). Perhaps age 50 and older. What do you think? That might be true - Arnies might well be naturally suited to shorter events but of course many are drawn to the challenge of longer ones too! Generally we'd recommend anyone to start with shorter distances and then go longer as they improve, it's the best way to develop and gain experience. I'm not sure we really see the Arnie-Bambino cross - they're probably more likely to be Bambinos. Male Bambinos are sometimes mistaken for Arnies.